Broke out of nowhere with no warning whatsoever. Went from sitting to standing on a small incline, and first pedal stroke... crack and down. This stem had gotten some decent mileage and use, but I will be switching to all aluminum steering from now on ... not including fork. I believe this is a look branded easton ea90. Came out of it relatively minor. Mainly right elbow trauma and minor road rash and a chainring gash. Yikes. He's lucky he was going slow when it broke. Interesting. 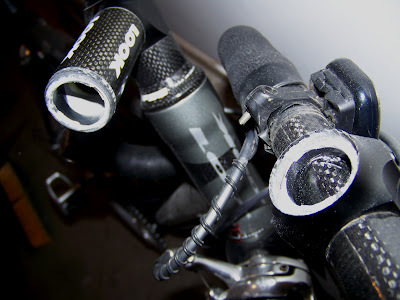 If you look at the construction of the stem, it's a carbon tube with aluminum clamps on either end. The failure appears to be at the aluminum internal insert, not the carbon tube. Seems like the aluminum had a fracture and the carbon covered it up. Scary! I would have said it was a failure of the adhesive. Dangerous either way, of course. That is not a 'Look branded Easton EA90' stem as the owner claims. Easton did not make stems for Look and the EA90 is all aluminum, not an aluminum/carbon combo as what's pictured. what he said...that ain't no Easton EA 90...I've ridden the hell out of mine and it's a champ...and it's alu, not carbon. Hi. Interesting looking bars. Could you tell me what they are please?